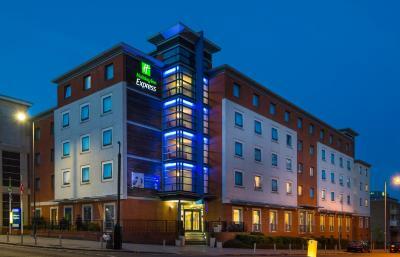 Lock in a great price for Holiday Inn Express Stevenage – rated 8.5 by recent guests! the staff were very accommodating. We have just moved from Canada and they helped us know a little more about the city. They also stored our luggage for us. Clean facilities. Soft bed. Nice space in room. Quiet soundproof room. Staff friendly. Very pleasant staff, good breakfast and great value for money. Was conveniently located to shopping center & train station for London. Trains run frequently to London,average journey time 25 minutes. The Sunday morning duty manager was exceptional. Went above and beyond. Sorry didn’t get his name. Natasha at the front desk was very helpful courteous and very professional. The beds were very comfortable and room size perfectly adequate for our short-term stay. The staff friendly and helpful. The breakfast was freshly cooked and tasty - with gluten free bread and vegetarian (Quorn) sausages on request. There were cereals, croissants, yogurt, fruit, etc as well as tea, coffee and juices, all frequently replenished. Great 2 nights stay out at the Holiday Inn Express Stevenage. Excellent clean tidy spacious room work comfortable double bed, great power shower with constant hot water , excellent wi fi , great flatscreen TV , all the usual hospitality stuff & more ! Friendly warm welcoming staff upon arrival & all through out the stay. Fantastic location 5min walk from train station & just off the A1 main road link to London. This is why the hotel exceeded my expectations yet again & I highly recommend this hotel for Fantastic value which included the great tasty breakfast as well !!! Holiday Inn Express Stevenage This rating is a reflection of how the property compares to the industry standard when it comes to price, facilities and services available. It's based on a self-evaluation by the property. Use this rating to help choose your stay! One of our best sellers in Stevenage! 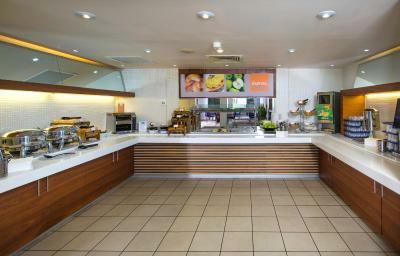 Holiday Inn Express Stevenage is a modern hotel in the town center offering comfortable accommodations. Stevenage railway station is 1,300 feet from the property, with a 25 minute train connection to Central London. Junction 7 of the A1 motorway is just over 1 miles away, while Luton Airport is 15 miles from the hotel. All of the spacious rooms with attached bathroom at Holiday Inn Express Stevenage have a flat-screen TV, a power shower and air conditioning. WiFi is free and breakfast buffet is included in all room rates. Knebworth House is 2 mi from the accommodations. The nearest airport is London Luton Airport, 7.5 mi from the property. When would you like to stay at Holiday Inn Express Stevenage? A wheelchair accessible room suitable for up to 2 adults. This spacious room has a double bed, wider doorways and adapted bathroom facilities with roll-in shower . It also features free WiFi, a 32-inch TV with Freeview. There is also a visual fire alarm. A wheelchair accessible room suitable for up to 2 adults. This spacious room has 2 single beds, wider doorways and adapted bathroom facilities with roll-in shower. It also features free WiFi, a 32-inch TV with Freeview. The fully air conditioned Holiday Inn Express Stevenage hotel, is based in the heart of Stevenage town centre yet just 25 minutes from central London by fast rail link, and 30 minutes from the historic city of Cambridge. The hotel has been open since 2004. Whether you are a leisure or business traveller in Stevenage enjoy the combination of an excellently positioned Stevenage, modern, contemporary design and a great budget hotel price. House Rules Holiday Inn Express Stevenage takes special requests – add in the next step! Holiday Inn Express Stevenage accepts these cards and reserves the right to temporarily hold an amount prior to arrival. On arrival, a credit card or cash deposit is required to confirm a reservation. If paying by cash, full payment is also required at check-in. Please note that when paying with cash, a valid photo ID and a damage deposit of 100 GBP is requested upon check in and is refundable upon check out, subject to a damage inspection. Please note that there is no designated drop off point immediately adjacent to the hotel, except for blue badge holders who are permitted to use the accessible spaces to the rear of the property. Guests booking family rooms are requested to specify the number and ages of children at the time of booking. Parking is available at the Matalan car park opposite the hotel for a charge of GBP 5 per vehicle from 14:00 until 10:00 the next day. Parking fees are to be paid at reception. Alternatively guests can park at the nearby NCP, where they will receive a discounted rate by getting their ticket validated at reception. There is also a limited number of car parking spaces available onsite and these are reserved for Blue Badge holders only. was only there one night so didn't experience much. breakfast was fine for someone on the go. So cheap for our overnight stay. Staff very helpful and great breakfast. Not having more options for breakfast. Bed was really comfy friendly staff very helpful. The breakfast choice excellent and good value for money. No toothpaste upon request as advertised in room. Hot water only warm. Receptionist treated me like a friend rather than a customer. Beds made up per my request. Staff, breakfast and rooms were good.